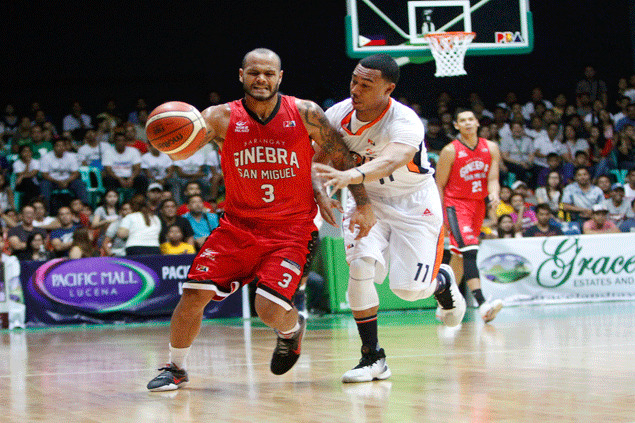 BARANGAY Ginebra remained the king of the road as it cruised past Meralco, 107-93, on Saturday night in a PBA Governors’ Cup game in Lucena to head into the All-Star break on a high note. Import Justin Brownlee showed the way, but Mark Caguioa provided the spark off the bench, while Sol Mercado punctuated a late run as the Gin Kings notched a second straight win and third overall in four games. Ginebra, which also stretched its road winning streak to six games dating back to last season, also handed the Bolts their second straight loss as their opponents fell to an even 2-2 win-loss record. Clinging to a precarious three-point lead with less than five minutes left in the Petron Saturday Special, the Gin Kings banked on a 12-1 run, capped by six straight points by Mercado to pull away. Mercado finished with 19 points on 5-of-6 shooting from the field and 6-of-7 from the foul line, on top of four assists and two boards in 27 minutes. “Sol did a good job playing kind of small forward—he’s really small, but he played big tonight,” Gin Kings coach Tim Cone said of Mercado, who started in place of injured starting three-man Chris Ellis. Brownlee tallied 26 points, six assists, and three boards, while Caguioa added 13 points, six boards, three steals, and two assists in 18 minutes. Japeth Aguilar also came through in the crucial stretch, wounding up with 15 points and six boards. Meralco import Allen Durham continued to be bothered by his protective mask as he registered only 17 points on 8-of-18 shooting, although he contributed in other ways, scattering 12 boards and eight assists.